Arkansas Peppered Ham for sale. Buy online at Zingerman's Mail Order. Gourmet Gifts. Food Gifts. Arkansas ham is tasty as can be. The jacket of peppercorns balances the natural sweetness in a way that I find really pleasing. I like things spicy, but this isn’t like that. In fact I served it last Easter and even the blandest tongues at the table, those who balk at anything spicier than mild salsa, thought it was amazing. The real kicker is that it’s got the bone in, which doubles the flavor by my measure. Instructions for heating are included, but you can also serve it cool. 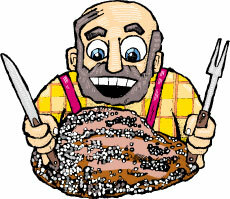 The whole bone-in unsliced ham has been brined, smoked, and cooked, though it has not been aged. While we're no longer selling the whole, bone-in peppered ham, we do still have the smaller half peppered ham.